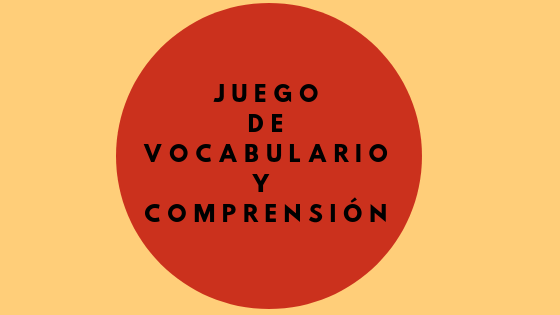 Today you get a 2 for 1 special in this blog as we are going to practice both, your listening comprehension and your vocabulary. We have practice this before, and I think it is a great way to learn. So let me tell you quickly what is all about, you need to watch the video and in it I am going to describe 5 Spanish words, and you need to guess the words I am describing. First I will give you the description of the words and the number of letter in each one, and after I will repeat the descriptions and this time I will give you some clues, by clues I mean I will show you some of the letters in the word and straight after we will see the Spanish word described. The video is in Spanish, so if you are a beginners it might be a bit tricky for you…but…I would love you to try anyway as it will be good for you to get use to the Spanish sounds. I hope you enjoy as much as I enjoyed creating it for you. -¿Te ha gustado el video? – Did you enjoy the video? -¿conocías todas las palabras? – Did you know all the words? -¿cuál es tu palabra favorita?-what is your favourite word? ¡Ten un buen día- Have a good day! I will see you in the comments!